Google collects a lot of personal data about you and uses it to target search results and ads. In some cases, this data makes cool and useful personalization features possible. In other cases, it’s primarily for Google’s own monetization strategies — though Google does not directly sell your data to any third parties. Plenty of people feel that’s a fair trade-off for a fair product, but others are keen to opt out of this data collection and delete all the personal data Google has collected. I even axed Google from my life for a while, partly because of this deal. But whether you’ve decided to drop Google entirely and delete your Google data, or you just want to make sure you’re keeping good personal records, downloading that data is always an option. Go to https://takeout.google.com/settings/takeout in your browser. Here you’ll find all the tools Google has provided for exactly this purpose. You can choose the archive format for the downloaded file. Note that the file may be huge, so a compressed version could be easier to manage. You’ll be presented with a list of Google services that involve collection of data or storing of your creations, ranging from Calendar events to Hangouts chat logs to your Blogger posts. Search and Location data—often the lightning rods of privacy concerns—are among the apps listed. Check off all the applications and products from which you want to download data. You can also click the button that toggles between Select none and Select all in the top-right corner. Once you’re satisfied with your selection, click Next at the bottom. Now the final step is to choose how you’d like to download your data—specifically, file type, archive size, and delivery method. Most users will want to stick with the default .zip format for the file type. This is an archive file standard that most operating systems can work with. Think of it like a sealed folder that you can unpack at any time to access the files inside. Archive size gives you some options to make sure you can download it comfortably on your internet connection. Breaking it up into smaller files is easier for slow internet connections. The default of 2GB will work for most people, but feel free to customize. 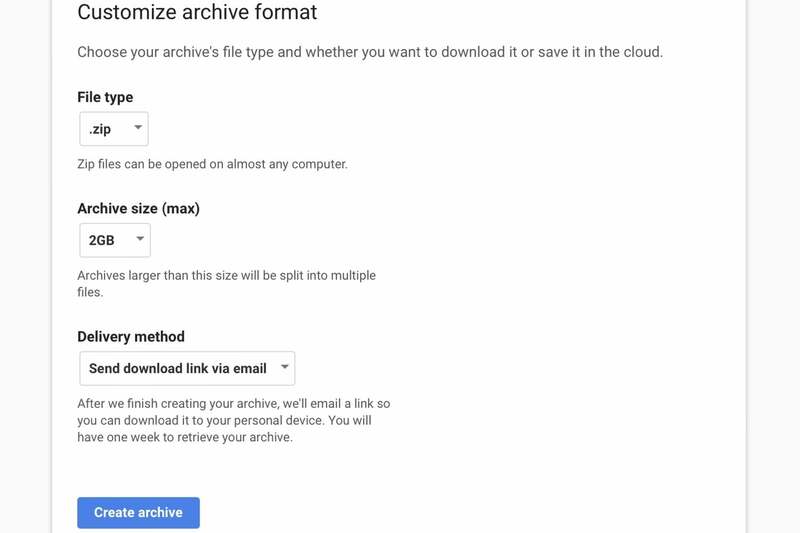 Finally, Google can send you a download link via email, or add the files to your Dropbox, Google Drive, or Microsoft OneDrive account. If you use one or more of these cloud storage services, pick your favorite. Otherwise, just ask for the download link so you can download the files to your physical hard drive. Click Create archive. 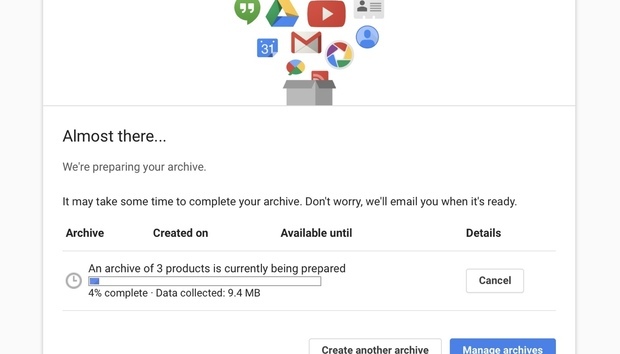 Building the archive can take quite a while, but Google will send you an email when it’s ready. If you want to view the files, just extract the .zip file on your computer and browse freely. Just keep in mind you’ll need applications that support each kind of file to view them — for example, if you downloaded some Google Sheets files, you’ll need another spreadsheet application like Microsoft Excel to open them. Are you at risk from Amazon's S3 bucket problem?